a PEEK in Santa’s PACK! Here are some off the more spectacular mechanical toys Junior will find under the Christmas tree this winter. THOUSANDS upon thousands of toys, many of them novel and spectacular, were recently pre-viewed by the nation’s toy dealers at the 1947 American Toy Fair, held in New York. So productive was the first full year of peace-time toy engineering that the manufacturers’ and jobbers’ wares had to be distributed among two large hotels and several office buildings. 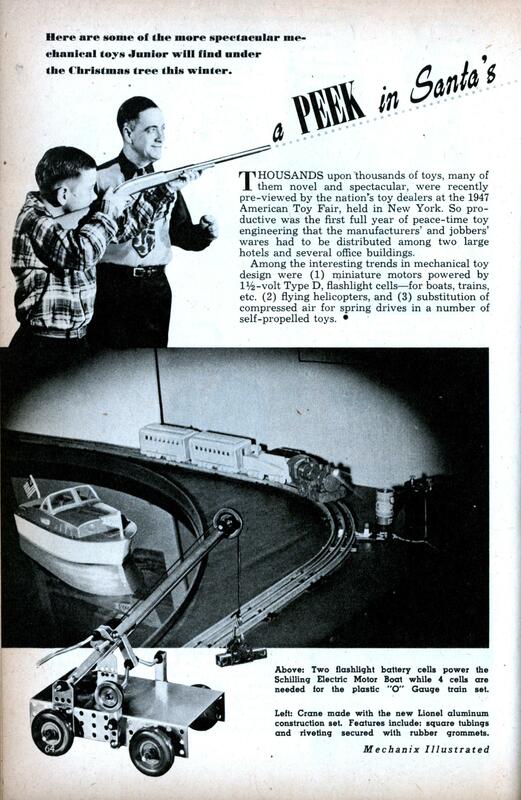 Among the interesting trends in mechanical toy design were (1) miniature motors powered by 1-1/2volt Type D, flashlight cells—for boats, trains, etc. 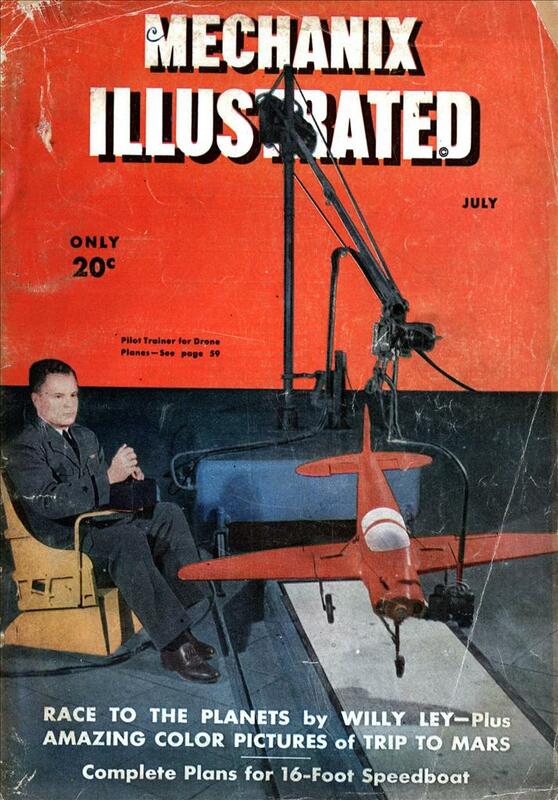 (2) flying helicopters, and (3) substitution of compressed air for spring drives in a number of self-propelled toys. I wonder if that train engine was red plastic with yellow cars from Louis Marx and Company? Marx later went to conventional model train transformers with both plastic and metal trains. My very first had spring powered motors. And oh yes, be careful with that rifle you don’t shoot somebody’s eye out! A Christmas Story? “You’ll shoot your eye out!” Thanks Modern Mechanix Blog for giving us another good year! As a kid growing up during the war virtually all Christmas toys were made of cardboard or wood. Some were quite clever and fun such as the old “Build-a-Set” forts, castles and towns that we would assemble ourselves. They looked pretty good too. They never lasted long and I wonder if any of them survived. I enjoyed getting them and putting them together. In the first years after the war, when materials became available again, toy makers were coming up with lots of pretty innovative things for kids to play with like some of the stuff shown here. Most were made in this country since the other nations involved in the war were still too devastated to be manufacturing toys for export. This is a fun article and brings back lots of memories. Thanks! These are the sort of toys my parents would remember. Lots of steel that could take abuse, and get passed down from the older kids to the younger ones. Does anybody else get their hopes up for just a milisecond when they see something cool like this and the words, “Buy on Ebay”? Thanks again Charlie for another great year. I still hope to get to the restaurant someday soon.